NEW DELHI (AP) — India and France pledged Saturday to work together to ensure freedom of navigation in the Indian Ocean and signed an agreement to expedite construction of a major nuclear power plant in India by a French company. 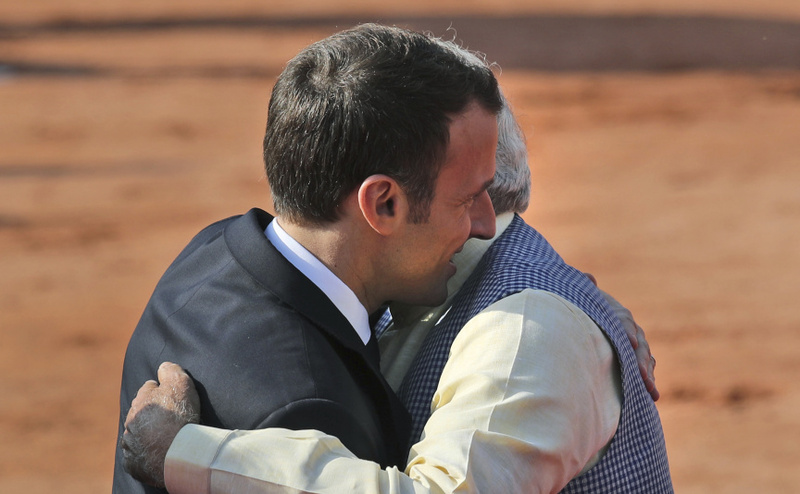 After talks with French President Emmanuel Macron in New Delhi, Indian Prime Minister Narendra Modi also highlighted a solar alliance and cooperation between the two countries in defense, security, technology, space and counterterrorism. "And I dream to have more and more Indian citizens coming to France -- studying, becoming entrepreneurs, creating startups -- and I want my country to be a best partner in Europe, an entry point," Macron said at a reception ceremony. "I want to double the number of Indian students coming to France," he said later on Twitter. "Both our countries believe that for world peace, progress and prosperity in the future, the Indian Ocean region is going to play a very important role," he said. The United States considers India a critical anchor in a regional strategy for the Indian and Pacific Oceans to blunt an increasingly assertive China. India is rallying support of countries including France and Australia on the maritime security front. Shivani Singh, an Indian researcher on nuclear security, said France, like India, is an Indian Ocean power with a similar culture of strategic autonomy. "France has the largest Exclusive Economic Zone in the world, of which 24 percent lies in the Indian Ocean region," Singh wrote on her blog on Friday. France has three Indian Ocean territories -- Reunion, Mayotte and the French Southern and Antarctic Lands -- comprising a total of almost 1 million French citizens. "France also has military bases in Djibouti and the United Arab Emirates," Singh wrote. "This gives France significant sovereign, demographic and economic interests to defend militarily in the region." France and India also agreed to exchange information and technical experts in the fields of environment and climate change. The nuclear agreement is considered significant, with critics saying that Jaitpur, the site of the six-unit plant, which is to generate 9,900 megawatts of power in western India, is in a seismic zone. The opposition has grown since Japan's nuclear accident in 2011, with several villagers refusing to hand over their land to the Indian government for the project. On Saturday, the nuclear agreement was signed by state-run Nuclear Power Corporation of India and the French firm EDF. In 2016, India signed an $8.78 billion deal with France to buy 36 Rafale fighter jets in "ready to fly" condition, meaning they will be made in France. India says that access to solar technology is becoming a reality, with costs coming down and grid connectivity improving. Macron also paid homage to the tens of thousands of Indians who died in World War I, and said India is being invited to a major ceremony being planned in Paris for Nov. 11, the 100th anniversary of the war's end.